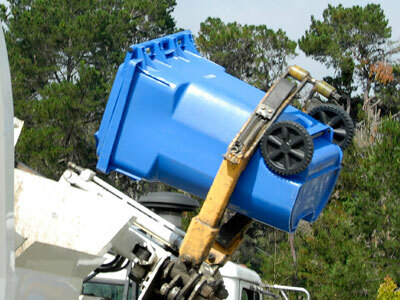 Standard residential services are provided to the City of Monterey using a 35 gallon brown wheeled cart for garbage, a 64 gallon green wheeled cart for yard waste, and a 64 gallon blue wheeled cart for recycling (35 gallon wheeled recycle carts are available for those who request them). The monthly service charge for standard service is $21.85 per month. There are several variations to this basic service that allow customers to select containers that best meet their needs. Learn more about services and billing. Discounted services are available for some eligible residential customers (Review Discount Service). We also offer motor oil collection (see HHW). Please call or email our office to request an oil recycling container. Multi-family units can rent 64 and 96 gallon wheeled carts or use large dumpster containers ranging in size from 2 to 6 cubic yards for garbage. Multifamily recycling usually involves using 64 or 96 gallon recycle carts. Large items such as appliances and furniture can be picked up upon request for standard residential customers (Sorry, this service is not offered to multifamily or commercial customers). Most items are collected at no additional charge. However, some items (refrigerators, TVs, computers, etc.) require special handling at the landfill and are charged at the landfill's special handling rates. Up to 3 large items can be pick up per appointment, and four appointments are allowed per year. All you have to do is call 372-7977 to schedule the appointment and place the items out on the curb on the date given by our staff by 8:00 a.m.
Place cart either on the streets edge, in the gutter, or on the curb. Allow 18 inches on all sides of the each cart. Do not place under trees or street signs. Do not place cars where they are obstructed by vehicles. Please place carts with the lids opening towards the street. Please do not tie the lids shut. considered a contaminant. Contaminated yard waste will be picked up as trash and you will be billed $12.55, or it will be left on the curb. *PLEASE NOTE: Not all items with the "recycling symbol" are acceptable. Only materials that are marketable are currently recyclable. Please call and ask if you have questions about materials not listed. DO NOT RECYCLE: Ceramics, plastic bags or film plastic, window glass, plastic bags, paper towels, tissue, drinking glasses, lightbulbs, food, garbage and organic or green waste materials, Styrofoam or polystyrene packing peanuts, metal pipe or plumbing fixtures or appliances, insulation, or hazardous waste. Note: The list above are common recycling contaminants. It is not practical to provide a list of every possible material that we are unable to divert for recycling. Please call and ask if you have questions about materials not listed. As in most cities, the City of Monterey has transitioned to automated residential collection vehicles. There are several advantages to an automated collection vehicle. One of the most significant advantages is that it greatly reduces the physical impact that refuse and recycling collection has on the collection personnel, which will allow our employees to work long past what was common for manually collection vehicles. Another advantage is that these trucks are designed so that they no longer have to use high engine revolutions to service the accounts, which equates to less noise, less emissions, and lower fuel consumption. Currently there are three of these automated collection vehicles in use in the City of Monterey. For these automated collection vehicles to operate most efficiently, the carts need to be placed at the curb or streets edge on the proper manner, as described above.